ORSON WELLES WITH A LAPTOP–that’s how Wired magazine describes high-flying software developer Daniel Skye. But Daniel’s on the verge of bankruptcy and divorce, obsessed with the best idea he’s ever had: an interactive movie/game hybrid for tablet computers that will forever change the way we see entertainment–that is, if it doesn’t ruin its creator first. He flees to Shanghai, where Pierre, an old photojournalist friend, knows people with money. But Pierre has his own agenda, helping a clandestine group of Chinese protesters. On the eve of a global conference on carbon emissions, they’re desperate to publicize the human cost of Shanghai’s real estate explosion and expose the corrupt officials and murderous property developers who are driving it. As Daniel searches the back alleys of Shanghai for pictures of a disappearing city, he is drawn ever deeper into a world of violence, arson, and killing. In the end, he will have to choose. How much is he willing to sacrifice for the best idea he’ll ever have? 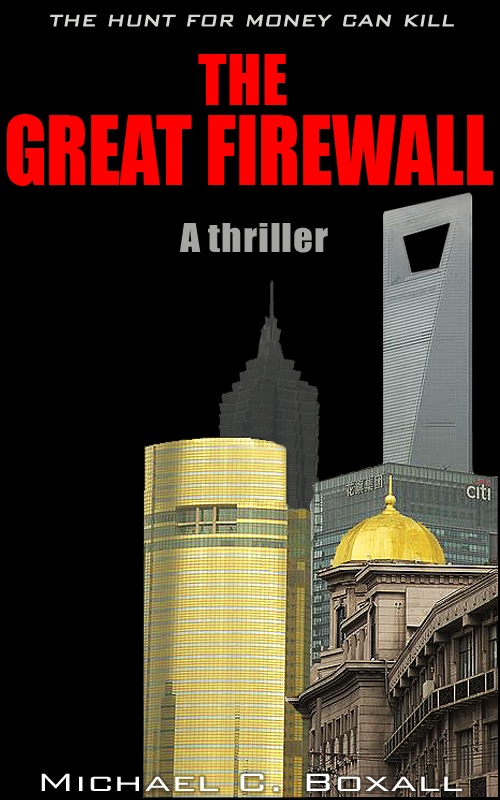 Fast-paced and multi-layered, The Great Firewall is a thriller for the twenty-first century, capturing the jagged intersections of technology and humanity in the most exciting city in the world. It’s available at Amazon.com, and you can also read an extract here.